We present a 24-year-old man who developed primary cytomegalovirus peritonitis without gut perforation, but with concomitant colitis 6 weeks after liver transplant from a deceased donor for end-stage liver disease because of primary sclerosing cholangitis. The patient was treated only medically, with no need for surgery, and is well at 12 months. This case represents the need for suspicious for cytomegalovirus peritonitis in the appropriate setting in post liver transplant even in the absence of perforation. Cytomegalovirus (CMV) is a common complication in the first 6 months after solid-organ transplant including the liver.1 Posttransplant disease may occur without specific organ involvement, which is referred to as CMV syndrome, and may involve specific organs. The colon is the most commonly affected organ; however, other organs including the liver, the retina, and the lung also may be involved. Peritonitis with CMV is a rare complication of this infection. Most cases have been reported in patients with acquired immunodeficiency syndrome asso-ciated with perforation of the colon owing to colitis in pre-HAART era.2 Here, we a present a case of viral peritonitis after a liver transplant without bowel perforation. A 24-year-old man who underwent a transplant for end-stage liver disease, caused by primary sclerosing cholangitis (PSC), presented to clinic with a spiking fever of 1 week’s duration. He was diagnosed as having PSC 7 years earlier associated with ulcerative colitis. His last colonoscopy was done 3 months before transplant, and it showed patchy moderate inflammation throughout the length of colon confirmed by biopsy with no evidence of dysplasia. In pretransplant work-ups, tuberculin skin test was less than 5 mm after 72 hours, but CMV antibody IgG was positive. He underwent a liver transplant with Roux-en-Y anastomosis from a deceased donor on December 25, 2013. The CMV status of donor was not known. Immunosuppression induction was with 1 gram methylprednisolone for 3 days. He had an uncomplicated postoperative course and was discharged on day 10 after transplant on tacrolimus 2 mg twice daily, mycophenolate mofetil 1 gram twice daily, prednisolone 20 mg once daily, cotrimoxazole 80/400 mg at bedtime, mesalazine 3 grams per day, with calcium and vitamin D supplements. Upon discharge from the hospital, his serum concentration for the pp65 CMV antigenemia, as well for CMV PCR, was negative. The explanted liver had no evidence of cholangiocarcinoma. He was well for the next 6 weeks, when he noticed feverishness, nonproductive cough, and sneezing followed by headache, nausea, vomiting abdominal pain, and diarrhea, which was watery 4 to 5 times per day without visible blood. He was admitted in our center again on of February 12, 2014. On admission, he was afebrile with stable vital signs, but he had herpetic lesions on lips. An abdominal examination showed shifting dullness, bulging flanks, and mild generalized tenderness. Bowel sounds were normal. His course in the hospital was without fever. Abdominal sonography revealed ascites, few small lymph nodes in para-aortic region measuring at most 4 mm in diameter, an enlarged spleen, and a normal transplanted liver. An abdominal computer tomography scan was unremarkable except for presence of ascites and splenomegaly. Specifically, there was no evidence of perforation of hollow viscus or intra-abdominal collection. Laboratory data and serial abdominal fluid analysis are shown in Tables 1 and 2. Abdominal fluid staining with a Gram stain and an acid-fast stain was negative. Serial liver enzymes and urinalysis were normal. Blood culture and ascetic fluid culture for microorganisms including aerobic, anaerobic, mycobacteria, and fungi were negative. With the impression of peritonitis and herpes labialis, acyclovir, imipenem, vancomycin, and metronidazole were started intravenously. No change in diarrhea, abdominal pain, and ascites was noticed after 3 days of treatment. On day 3 of the admission, a colonoscopy was done for the patient, which showed patchy inflammation of the whole length of colon with more severe involvement on right side of the colon, and normal appearing terminal ileum. Biopsy confirmed CMV colitis on cecal and sigmoid but not on rectal biopsies. 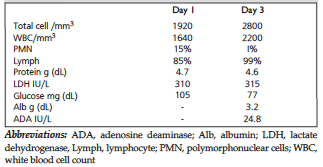 Three days after admission, the results of CMV PCR of first abdominal fluid were reported positive at 500 copy/mL, while serum PCR for CMV, as well as PP65 antigenemia, were negative. Polymerase chain reaction of abdominal fluid for Candida also was negative. At this time, intravenous ganciclovir was started and acyclovir discontinued. After 1 week’s treatment with ganciclovir, diarrhea and abdominal pain stopped. A physical examination at this time was normal with no shifting dullness. An abdominal sonography showed only minimal fluid. The patient was discharged on valganciclovir for another 6 weeks. The patient is now well with no recurrence of ascites or fever, and with completely normal paraclinical data including abdominal sonography after 1 year follow-up. Although CMV peritonitis also has been reported after solid-organ transplant, it is rare and mostly associated with gut perforation. In a series of CMV infections after solid-organ transplanted patients from Spain, 2 cases of peritonitis were reported but both had intestinal perforation.6 Another series of 3 patients with CMV-associated peritonitis were reported after renal transplant, but all had sigmoid perforation documented on laparotomy.7 There is one report of CMV peritonitis without gut perforation after renal transplant in a patient who was previously on peritoneal dialysis.8 In that case, induction of immunosuppressive treatment was performed with the anti–CD-52 antibody alem-tuzumab combined with methylprednisolone. The patient presented 1 month after transplant with severe abdominal pain. The authors’ explanation for this presentation was intense immunosuppression in the setting of positive CMV status of the recipient. The present case is probably the second case of CMV peritonitis without gut perforation after a solid-organ transplant and the first such case after liver transplant. In this case, the CMV infection was the result of reactivation, as the patient had positive serology for CMV infection before transplant. The use of immunosuppressive drugs including mycophenolate mofetil may have contributed to reactivation of CMV. Because of new-onset ascites in the setting of colitis, our initial impression was gut perforation with secondary peritonitis. We started antibiotics to cover this possibility from beginning, but the absence of clinical signs of peritonitis, lymphocyte dominancy of cell count in serial ascetic fluid analysis, negative cultures, and negative CT scan of the abdomen excluded this possibility. There was also no response to antibiotics. We treated our patient with ganciclovir 10 mg/-kg/day during the first week, and continuing with valganciclovir 900 mg twice daily for the next 2 weeks, and then valganciclovir 900 mg daily for another 3 weeks. Our plan was to continue antiviral medications further for 3 months to avoid recurrence, but the patient could not afford this therapy because of his economic situation. Despite this, there was no recurrence of disease in any form in 12 months’ follow up. This may raise concern about the duration of treatment and rational for prophylaxis of CMV infection after treatment of CMV local disease. The pathogenesis of CMV peritonitis in this setting is not clear. It could be because of translocation of virus from inflamed large bowel secondary to superimposed CMV colitis on preexisting ulcerative colitis. Other explanations, such as viremia with superimposed infection of the ascites fluid, seem less likely, as our patient did not have ascites before presentation at the hospital. An argument could be raised as to why our patient did not receive prophylactic treatment for CMV because his CMV serology was positive before transplant. In our center, our current protocol in adults with positive serology for CMV is to monitor them with weekly assays for pp65 antigen and CMV quantitative PCR and start treatment accordingly. We found this protocol more cost effective in our setting, with more than 90% of adult recipients being serologically positive for CMV. In conclusion, this case report represents the need for suspicion of CMV in the appropriate setting in postliver transplant. Even in the absence of perforation, CMV could present with peritonitis. After exclusion of other common causes of peritonitis after a liver transplant, CMV should be considered. Slifkin M, Tempesti P, Poutsiaka DD, Snydman DR. Late and atypical cytomegalovirus disease in solid-organ transplant recipients. Clin Infect Dis. 2001;33(7):E62-E68. Wilcox CM, Forsmark CE, Darragh TM, Yen TS, Cello JP. Cytomegalovirus peritonitis in a patient with the acquired immunodeficiency syndrome. Dig Dis Sci. 1992;37(8):1288-1291. Liu PY, Cheng SB, Lin CC, et al. Cytomegalovirus disease after liver transplantation: a nationwide population-based study. Transplant Proc. 2014;46(3):832-834. Albu E, Mukherjee A, Rao D, Sehonanda A, Pai BN, Gerst PH. Emergency surgery for generalized peritonitis caused by cytomegalovirus colitis in a patient with AIDS. Am Surg. 1999;65(5):397-398. Tsai HC, Lee SS, Wann SR, et al. Colon perforation with peritonitis in an acquired immunodeficiency syndrome patient due to cytomegalovirus and amoebic colitis. J Formos Med Assoc. 2005;104(11):839-842. Toogood GJ, Gillespie PH, Gujral S, et al.Cytomegalovirus infection and colonic perforation in renal transplant patients. Transpl Int. 1996;9(3):248-251. Meier M, Hiss M, Hafer C, et al. 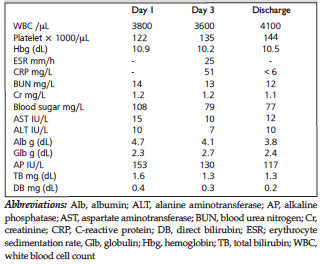 Cytomegalovirus peritonitis after renal transplantation under induction therapy with alemtuzumab in a young woman previously treated with peritoneal dialysis. Nephrol Dial Transplant. 2005;20(8):1771. Yehia BR, Blumberg EA. Mycobacterium tuberculosis infection in liver transplantation. Liver Transpl. 2010;16(10):1129-1135. Shen YC, Wang T, Chen L, et al. Diagnostic accuracy of adenosine deaminase for tuberculous peritonitis: a meta-analysis. Arch Med Sci. 2013;9(4):601-607. Durand CM, Marr KA, Arnold CA, et al. Detection of cytomegalovirus DNA in plasma as an adjunct diagnostic for gastrointestinal tract disease in kidney and liver transplant recipients. Clin Infect Dis. 2013;57(11):1550-1559. Metselaar HJ, van Campenhout MJ, van der Eijk AA. The best way to prevent cytomegalovirus infection after liver transplantation: the debate goes on. Transpl Int. 2013;26(6):590-591. Manuel O, Meylan PR, Rotman S, Fontana M, Moradpour D, Pascual M. Oral valganciclovir for cytomegalovirus colitis after liver transplantation. Transplantation. 2007 Jan 27;83(2):239-40.